Firstoff, I have been on the CB Forums for a while now (close to 20 months) and the Themes section was always of intrest. I am a 16 year old high school kid from Zurich, Switzerland, and a avid BB-Fanboy! This is my first theme, any constructive criticism is welcome... As well as tips and general feedback. OS5 looks with OS6 improvements! 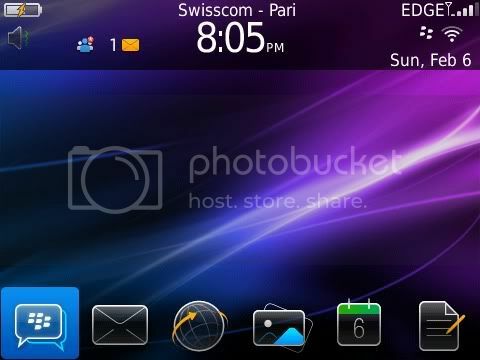 Free theme, looks and functions like the good old OS5. No Panes, 6 items on the home screen, 24 on application page. Last edited by CarlKrass; 02-07-11 at 01:29 PM. Rudysf, chaoticfae, e36andy and 8 others like this. 200 views and not one comment? looks and works great.. i love 6.0 but hate the sliding dock.. this is awesome thanks! A lot of people are shy. The theme looks great, thanks. anybody have any requests on how to modify the theme slightly? today section or so? Hi , i have two requests in fact. 1. it is possible to have exactly the same thing but with keeping 2 rows on today? 2. And having the name of the mailbox for example when select? Last edited by iamolive; 02-07-11 at 02:54 AM. alright, ill get to work the second point is not hard tho, i can make a "application name" box, which will display the name of the app you have selected on the homescreen. Thank you so much........this is awesome! I love OS6 but those damned scrolling tabs were so annoying,Lord knows this is so much easier.Once again thank you ! Whenever, I attempt to dial a number,the first digit is not displayed or even enter. Also to follow up on this issue,with the original theme once you pressed a series of keys(eg.a phone #) that did not correspnd to anything in phone's memory that the universal search recognized. It would realize that this was a phone # and give you an option to dial that number>showing the call send next to the number. I have noticed that this theme,keeps showing the keys entered as letters.......If you could clean this up, it would be greatly appreciated. Thanks in adavnce and keep up the good work! Love this- works perfectly on my 9700. Any chance of just making a Spacebar for QL shortcut and removing the shadowed top bar? Last edited by 9700FTW; 02-09-11 at 06:12 PM. I wish a directly option to open the clock from the homescreen. Last edited by Tecklop; 02-13-11 at 01:43 AM. 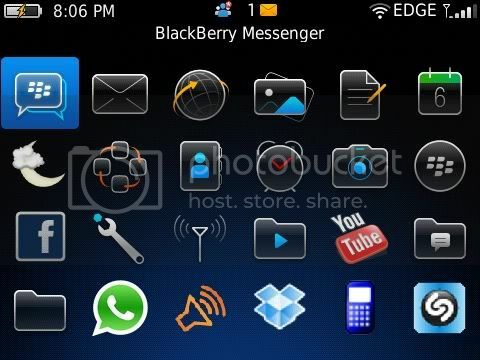 THIS WILL PROVE TO BE ONE OF THE MOST DOWNLOADED AND LOVED OS6 THEME'S AROUND!!!!!! Had to caps that for proof later. Awesome theme. I have allot of family that followed me to the Bold series from various OS5 phones and not many liked the OS6 theme. This truely gives the best of both worlds. I am very excited to share this. I look forward to more stuff from you guy. Evolve this theme to pure greatness! Ver much appreciated! Is the battery icon showing charge when the phone is actually charging for anyone? Hey guys, thank you so much for the positive feed back..
At the moment I am without my windows laptop, so I am unable to edit the theme for the requests that you have had! Also as I am alittle unexperience I would really appreciate if somebody could refer me to a guide or post with some details on how to fix some of these things! Perfect Theme bro! The sliding trays were driving me crazy. Now what's still annoying are the animation effects when scrolling, opening applications etc. Is there any way to make them go away as well? That would be a great help. Also please publish your Donation page. Well deserved.